Nia Griffith MP, together with fellow campaigners Siobhain McDonagh MP and Carolyn Harris MP are not satisfied that the latest announcement from Marks and Spencer’s on Friday goes anywhere near to answering the concerns of thousands of workers about cuts to pay and pensions. 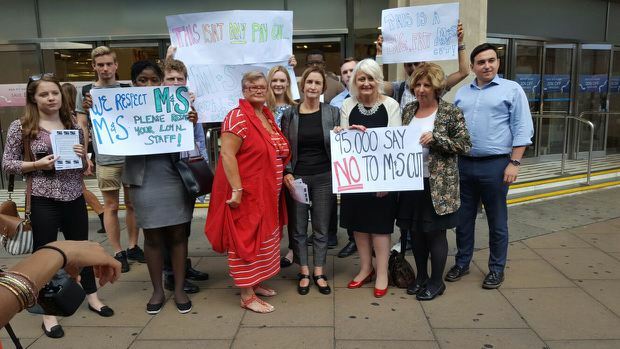 The announcement follows the visit last Thursday by the MPs to Marks and Spencer’s flagship Marble Arch store in London last Thursday to present a petition of over 90,000 signatures to the renowned retailer. The petition calls on the company to rethink its proposed changes to staff terms and conditions which include serious cuts in Sunday premiums, bank holiday pay, antisocial hours pay and changes to the pension scheme for long-serving members of staff. The company, which does not recognise trade unions, admits that some 2,700 workers stand to lose over £1000 a year, with 700 losing over £2,000, whilst the pension changes will affect some 11,000 employees. The MPs have now written to Steve Rowe, CEO of M&S to express concern at the way the firm is proceeding and to ask for an urgent meeting.